Spooooky Story Time... Wuuhhaa Ha Ha! 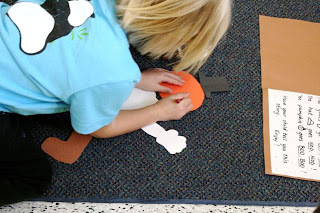 I received a request for Halloween story time ideas, so hopefully this post will be somewhat helpful for anyone in need of some spooktacular inspiration. My October favorites include The Little Old Lady Who Was Not Afraid of Anything (Linda Williams), The Teeny Tiny Woman (Paul Galdone), Go Away Big Green Monster (Ed Emberley), and Too Many Pumpkins (Linda White) & Pumpkin Pumpkin (Jeanne Titherington). The latter two, not so scary, but great October reads nonetheless. These have been my favorites for a while now. As I'm typing this, I'm thinking it's probably time to branch out and add some new titles to the repertoire. So please leave your suggestions in the comment sections. I need some!! Check out the photos below to see the fun time we had with our Little Old Lady inspired rebus readers last week. 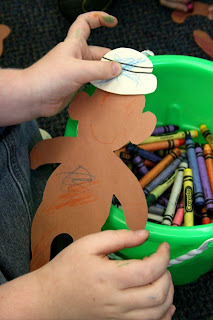 They had a fun pocket on the front for the children to store all their scarecrow pieces in. 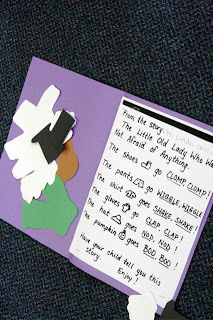 They each got to take their "book" (rebus reader) home and share the spooky story with others! And read here and here for more info and ideas to correlate with my books suggestions above. Been out of town. New post coming soon! Sorry for the delay! 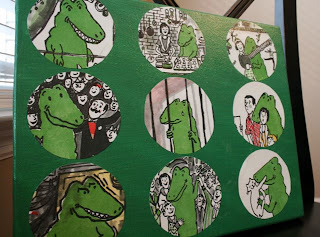 Handmade Kid Lit Art Canvases For Sale! I've been wanting to begin making these treasures for a while now. The swiftly approaching holiday season provided the perfect inspiration for me to carve out some time in my schedule. I'm selling these canvases to raise money for our Ethiopian Adoption! All the money earned from sales will go directly into our adoption fund. 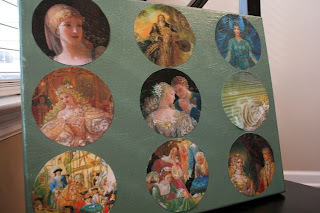 The canvases are made using up-cycled kid lit books. :) A great way to celebrate a story and its art! Email me at watsonadoption@gmail.com if you would like to purchase either (or both) of these. They're ready to find a great home! I have priced the Cinderella canvas slightly lower since it was the first one I made. It's beautiful, but not as "polished" as those that followed. Check back for more art to be posted soon! And visit here for more beautiful handmade items (and coffee!) that all helps our adoption! 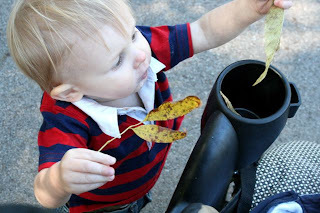 Autumn Adventures with My Little Reader! It was such a beautiful day here today! Isaac and I went on a walk, and it turned into a bit of a nature hike. 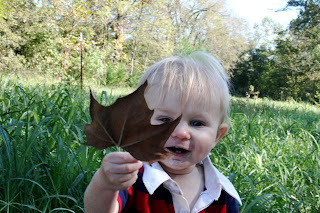 We were crunching through the leaves, and then began finding some pretty ones! We decided to take them home with us. Isaac was particularly excited about this one. 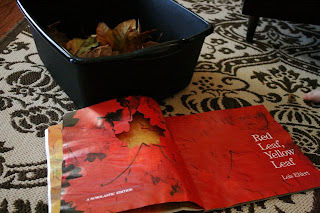 We got home and found a book all about leaves to read (Lois Ehlert's Red Leaf, Yellow Leaf). 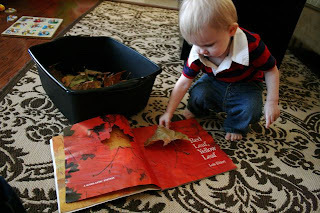 Isaac compared the leaves in the book to some we found on our walk. He really like the leaf shaped holes in the illustrations. 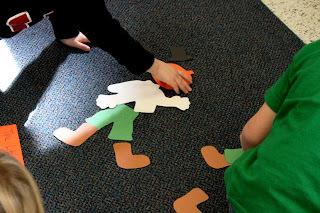 Then we talked about how leaves fall from the trees. 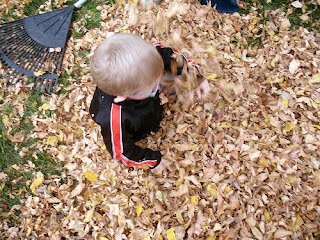 Here's Isaac being a tree and making some leaves fall. 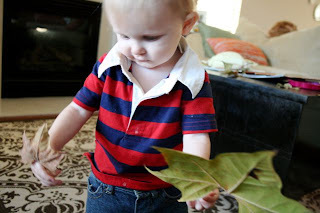 And here he is comparing some leaves. 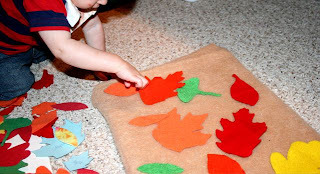 Then after dinner, we got out the felt board and played with some soft, colorful leaves. I keep forgetting to post this week. I don't know what's wrong with me, but I'm blaming the paper pregnancy! So these photos I'm posting were from a couple months ago, but might as well have been taken yesterday. These are a couple of toys Isaac's been diggin' as of lately. 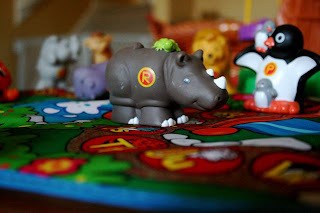 Today Isaac pulled out the mat for his Little People Zoo, pictured above, and threw up his hands and shrugged his shoulders when he didn't see the bag of animals sitting with it. So adorable! I have a thing for alphabet toys. Anybody else have this issue? I think I need to broaden my horizons a bit. Actually, I've been trying to incorporate print in Isaac's environment more, but am a little stumped as to how to do this. I don't particularly want to put labels on everything in my house. Anybody have any ideas or suggestions? How are you incorporating print in your little one's environment? The weather is cooling off, the school-agers are back in school, those annoying inflatable ghost decorations are popping up in your neighbors' front yards again... Autumn is here! And I don't know about you, but something about autumn makes me want to curl up and indulge in some frivolous reading. Don't know why that urge comes on, but it does, every year at this time. And I always give into it! No biographies, nothing deeply insightful or informational... I want fluff! Perhaps our kiddos are having reading cravings as well? And if they're not, maybe they should be! Let's facilitate some cozy reading - autumn style! Here are my suggestions. Add yours in the comments section. - Let your school-agers unwind with a book after hopping off the bus in the afternoon. Have some warm apple cider or popcorn balls ready for them (you can buy these pre-made if your not the domestic type), and invite them to kick up their feet up with a comic book, a magazine, or some heavier reading if they desire. Be sure to join them in the fun and be a reading role model. - Take a trip to the park and bring some books along to read under a beautiful autumn tree! Don't forget to bring some blankets to sit on, and to wrap around you! 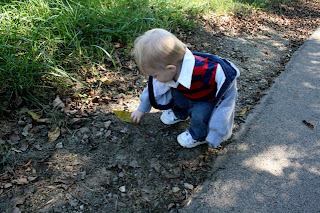 - Plan a nature walk or a trip to the pumpkin patch, and read some appropriately corresponding books before you go. Then discuss the things you see and experience, and how it compares to what was in the book/story. 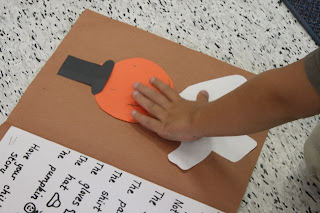 - Talk about Halloween coming up and tell some spooky stories (appropriate to the child's age). This is also a great activity to be done on Halloween, perhaps after trick-or-treating while they snack on some of their bounty! - Check your paper for fall festivals going on. There's often storytelling or storytimes of some sort going on at these. As many of us know, the act of teaching often leads to us learning much ourselves. And here's some of what I've learned from all the reading to preschoolers I've done over the past 4 yrs. 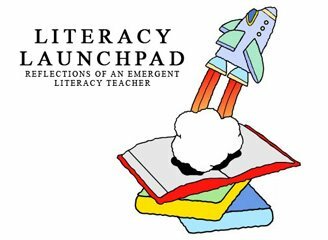 of Literacy Launchpad. I can make a story time sparkle, or completely kill it, all by the attitude I come into it with. 2. A good story can turn a bad day around instantly. Crabby kiddo? A sad morning? Story time to the rescue! and this magic is not limited to children. 3. Preparation does not necessarily lead to success; in fact, it sometimes hinders it. Some of my best lessons have been the ones that felt the most thrown together at the last minute. Seriously! And conversely, many of my most well thought out, perfectly planned lessons have totally flopped. Go figure. Things don't always go as planned. Kids don't always sit as still as you want. Sometimes supplies get left at home. Book discussions go down unexpected bunny trails... These can turn out to be good things. Go with it! 5. Don't worry about what other people think. Man, if I had a co-teacher in class with me each week, I probably would be too embarrassed to do a lot of the silly things I do during my read alouds: the voices, the dramatic emphasizing, the crazy facial expressions... My story times would be nothing without them. So who cares what other grown-ups might think? The students live for it. It's all about being zany! 6. First impressions don't matter much. I've had quite a few students start class with me that had me wondering, "Oh lordy, how's this going to work?" But they always end up pleasantly surprising me (there was one rare exception, but it was a parent issue and not a student issue). 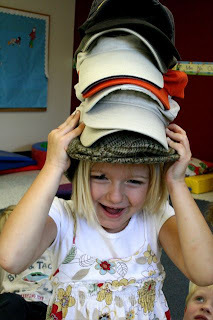 Often they're the ones that bring so much life to class that I'm distraught when they graduate onto kindergarten. Not with students. Not with a dream for a business... or a cause. Not with a lesson that seems to be going nowhere fast. Never give up. I always love reading Caps for Sale! It's definitely one of my favorites, especially when it comes to a read-aloud. It's always an engaging crowd pleaser. Children are mesmerized by it. It's like magic really. And I think there is a lesson to be learned in that. Because it is the simplest of stories, with simple illustrations. It's a traditional tale, re-told in a book that was published decades ago. There's nothing gimicky, or flashy about it. No rhymes or predictable repeating texts (not that there's anything wrong with that). No familiar characters or borderline offensive humor. It's just a good story. And there's power in that. It's appeal probably lies somewhat in the fact that it's a bit refreshing! So anyway, we read it and all enjoyed it! When I asked my students what they would do if monkeys stole their hats (or anything else), most of them responded with violent solutions. Yikes! Where does that come from? Is that just a kids thing, or is this generation just exposed to more of that (violence, that is)? I don't want to sound like a farty, old person here... Were we like that when we were little too? Missed a post last week. Did you notice? If you're wondering why I missed a post, visit here and find out. This has been my life lately. Things will return to "normal" eventually though, I hope. If my missing posts make you sad, click on the donate button on the right here :) This will help "normal" return quicker! 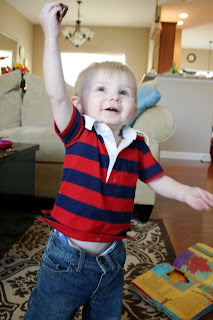 What's Your Favorite Toddler Lit Toy/Activity? I just realized what a weird question that is as I was typing it. But I do want to know! 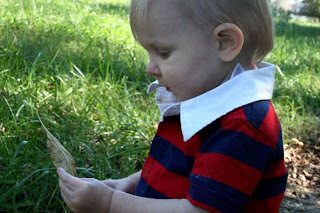 I touched on what My Little Reader, Isaac, has been up to in a recent post. And I wanted to share a little more about what he is liking these days, as promised. Isaac has changed a bunch even just from last week. He grabs books and drags them over to us to read. All day he does this! I love it! 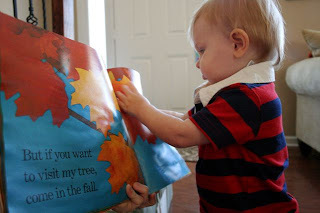 And I will drop whatever it is I'm doing if he comes to me with a book (and so will his Daddy). And he's probably catching onto this. I think this is a great association for him to form: Mom and Dad will stop whatever they're busy doing to read with me! 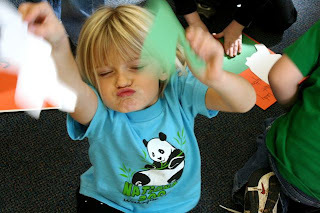 There are a few books that we have started doing silly actions with as we read them. He loves this! With Kitty Up he likes to touch the fire on the last page, and I'll pull his hand away and yell, "Ouch! Hot!" He giggles and then does it again... and again... and again. He also likes it when I take his hand and make him pet the dog on the last page. I make a cute little doggy noise as he does this, and he thinks it's great! Also, Ten Little Ladybugs is a current favorite. He likes to stick his finger through the little holes in each page, and have me grab onto them from underneath. This also gets big laughs. None of these silly things seem to distract him from the story though. He still sits and listens to the text (much longer than he had been doing last week) and still turns all the pages with me. I have introduced a few new books into his listening repertoire this week, and he's warming up to them. He gets attached to his favorites and I'm working to find a good balance between repeating his favorites, and introducing new stuff. I almost put his fridge phonics magnets away, 'cause it seemed like he wasn't playing with them much, and that very day they suddenly became his favorite toy again. 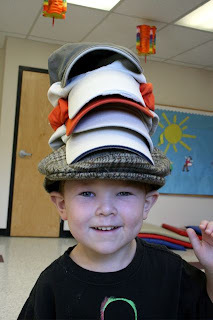 Maybe this kid is learning to read my thoughts... and/or my blog posts. :) It makes me smile to find these magnets scattered all over the kitchen floor again though. This foam alphabet/number puzzle has become a new favorite. Isaac got it for his birthday a few months ago, but I didn't bust it out till just the other week. I wasn't sure how interested he would really be in it, but he loves it. 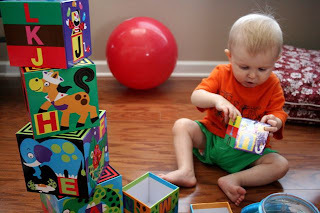 He loves pulling the pieces out of the box, he loves stamping all over the pieces when I assemble them together, and he loves to pull the letter pieces out and carry them around. I have to admit, I haven't done a lot of "teaching" with these toys. I'm usually busy washing dishes or folding laundry while he plays. I have lots of guilt about that, and I would like to change that (play with him more that is). And I need to come up with some more cool ideas to add to the learning fun. 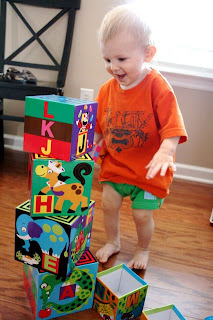 Looking for suggestions for toddler literacy toys and/or activities. Help out a first time mom out here! 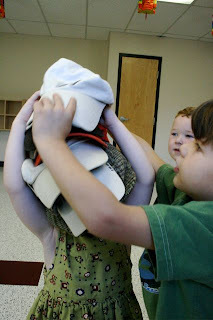 What did your kids play with, enjoy, and learn from?